Background: Cardiac resynchronisation therapy (CRT) is increasingly used in children in a variety of anatomical and pathophysiological conditions, but published data are scarce. Objective: To record current practice and results of CRT in paediatric and congenital heart disease. Design: Retrospective multicentre European survey. Setting: Paediatric cardiology and cardiac surgery centres. Patients: One hundred and nine patients aged 0.24–73.8 (median 16.9) years with structural congenital heart disease (n = 87), congenital atrioventricular block (n = 12) and dilated cardiomyopathy (n = 10) with systemic left (n = 69), right (n = 36) or single (n = 4) ventricular dysfunction and ventricular dyssynchrony during sinus rhythm (n = 25) or associated with pacing (n = 84). Interventions: CRT for a median period of 7.5 months (concurrent cardiac surgery in 16/109). Main outcome measures: Functional improvement and echocardiographic change in systemic ventricular function. Results: The z score of the systemic ventricular end-diastolic dimension decreased by median 1.1 (p<0.001). Ejection fraction (EF) or fractional area of change increased by a mean (SD) of 11.5 (14.3)% (p<0.001) and New York Heart Association (NYHA) class improved by median 1.0 grade (p<0.001). Non-response to CRT (18.5%) was multivariably predicted by the presence of primary dilated cardiomyopathy (p = 0.002) and poor NYHA class (p = 0.003). Presence of a systemic left ventricle was the strongest multivariable predictor of improvement in EF/fractional area of change (p<0.001). Results were independent of the number of patients treated in each contributing centre. Conclusion: Heart failure associated with ventricular pacing is the largest indication for CRT in paediatric and congenital heart disease. CRT efficacy varies widely with the underlying anatomical and pathophysiological substrate. Cardiac resynchronisation therapy (CRT) has become a standard treatment for adults with idiopathic or ischaemic cardiomyopathy and systemic ventricular dyssynchrony. Improvement in ventricular function, functional status and decreased mortality has been shown in recent large randomised trials.1 2 CRT has also been applied to the paediatric and congenital heart disease population. So far only a few case reports,3–5 small uncontrolled studies6–9 and one retrospective multicentre survey10 have reported benefit from CRT in this complex population. The aim of this multicentre European experience was to record the current practice of this evolving therapy, indications and predictors of benefit or failure in various anatomical and pathophysiological situations. Data from patients with structural congenital heart disease and congenital complete atrioventricular block regardless of age and from patients with dilated cardiomyopathy under the age of 21 years subjected to CRT up to the deadline of data collection were gathered retrospectively. Data collected consisted of demographics, underlying heart disease and its surgical treatment, morphology of the systemic ventricle, preceding ventricular pacing, New York Heart Association (NYHA) class and the method used to identify electromechanical dyssynchrony. Details of CRT system implantation were documented. Heart transplant listing, complications of CRT as well as death were noted. Non-responders were defined as those not responding clinically (decrease in NYHA class) and having no improvement in systemic ventricular function. Given the retrospective study design and the wide range of ages, functional assessment using the 6 min walk test or quantitative cardiopulmonary testing was not required. End-diastolic and end-systolic dimensions of the systemic ventricle were measured at the point of peak diastolic systemic ventricular free wall outward motion and peak systolic inward motion, respectively, and expressed as a z score indexed to a normal systemic left ventricle (LV).11 Systemic ventricular shortening fraction was calculated according to the following formula: ((end-diastolic dimension – end-systolic dimension)/end-diastolic dimension) × 100. In patients with a systemic LV the ejection fraction (EF) was measured by either the biplane Simpson method or the Teichholz method. Care was taken to use the same measurement method before CRT and at the last follow-up in each individual patient. For a systemic right ventricle (RV) or functionally single ventricle, the fractional area of change was measured from the apical four-chamber view. The grade of systemic atrioventricular valve was assessed using usual semiquantitative grading as none = 0, mild = 1, moderate = 2 and severe = 3.12 No details of mechanical dyssynchrony evaluation other than the method used were obtained. Values are expressed as either median (range) or mean (SD) depending on the distribution pattern of the data. Differences in continuous variables among groups of patients were evaluated by one-way analysis of variance, two-tailed t test or Mann–Whitney rank sum test, as appropriate. Paired comparisons were performed by paired t test. Predictors of improvement in systolic function and non-response to CRT were evaluated by univariate tests and were entered into a multivariable analysis (backward stepwise regression) if showing significant univariate correlation. The following independent variables were used: age at CRT, type of heart disease, systemic ventricular morphology, preceding ventricular pacing, initial QRS duration, QRS shortening by CRT, initial NYHA class, z score of the systemic ventricular end-diastolic diameter, shortening fraction, EF or fractional area of change and grade of systemic atrioventricular valve regurgitation. 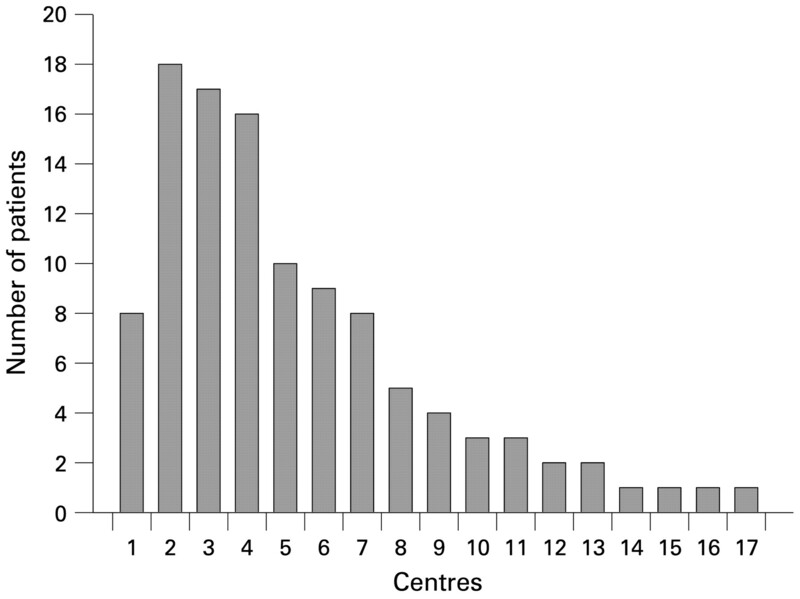 For the comparison between large- and small-volume centres the institutions were divided into two groups with either >10 or ⩽10 reported patients (fig 1). p Values <0.05 were considered significant. Calculations were performed using SigmaStat 3.1 and SigmaPlot 9.1 for Windows (SPSS, Chicago, Illinois, USA). Number of patients contributed by each centre (centres are numbered according to the number used in the author affiliations). The study group comprised 109 patients from 17 European paediatric cardiology and cardiac surgery centres (fig 1) with a median age 16.9 years (range 2.9 months–73.8 years) at initiation of CRT, and subsequent follow-up of a median of 7.5 months. The systemic ventricle was morphologically left in 69 patients, right in 36 and four patients had a functionally single ventricle. Eighty-two patients (75.2%) had a history of preceding major cardiac surgery (tables 1 and 2). Twenty-three patients from two centres (No 2 (Kardiocentrum and Cardiovascular Research Centre, Czech Republic) and 6 (Evelina Children’s Hospital, Guy’s and St Thomas’ Trust, London)) have been included in the previously published study by Dubin et al.10 Follow-up for these patients is longer in the current report. Twenty-five patients (23%) had ventricular dyssynchrony during intrinsic conduction. Ten patients (9%) had left bundle branch block with a systemic LV and five patients had right bundle branch block with a systemic right or functionally single ventricle. The remaining 10/25 patients had non-specific QRS prolongation. The majority of study patients (84/109, 77%) had dyssynchrony associated with single-site ventricular pacing for a median of 5.6 years (range 3 days–25.1 years) before the upgrade to CRT. Of those, all but six patients were paced from the subpulmonary chamber. The majority of patients (105/109, 96%) underwent evaluation of mechanical dyssynchrony by either conventional echocardiography (92 patients) and/or by tissue Doppler imaging (67 patients) without a prespecified protocol. A transvenous approach was used in 45 (41%) patients, thoracotomy in 36 (33%) patients and a combined approach in 28 (26%) patients. Patients in the transvenous group were significantly older: median 33.5 (7.1–73.8) vs 8.4 (0.2–67.5) years (p<0.001). Two ventricular leads were used in 105 patients. Two patients with a systemic LV and RV, respectively, had resynchronisation by a single ventricular lead placed transvenously or by thoracotomy at the site of ventricular conduction delay. Finally, one patient with transposition of great arteries after the atrial switch procedure and another patient with a functionally single ventricle received three ventricular leads in an attempt to better resynchronise a severely dilated ventricle. Additional concurrent cardiac surgery was performed in 16 patients (15%). CRT systems with defibrillating capability were used in 20 patients (18%). QRS duration decreased from a median of 160 ms before CRT implantation to 130 ms at last follow-up (p<0.001). Initial QRS duration was significantly longer in patients paced before CRT (mean (SD) 169 (28) ms) than in non-paced patients (mean 141 (30) ms, p<0.001). QRS shortening was also more pronounced (median −40 vs −10 ms, p = 0.001) in the previously paced group. Sufficient echocardiographic data to allow analysis was available in 89/109 patients. Table 1 summarises the impact of CRT on the total population and the four different diagnostic groups, with a significantly higher proportion of non-responders in the dilated cardiomyopathy group. For all further analysis of change in systemic ventricular size and function after CRT, patients with concurrent cardiac surgical procedures were excluded. After doing so the calculated overall increase in systemic ventricular EF/fractional area of change and decrease in the z score of the systemic ventricular end-diastolic dimension still remained highly significant with +11.2 (13.7)% and median −1.3, respectively (p<0.001 for both). Table 3 summarises the differences between patients with systemic LV and RV. Initial systemic ventricular end-diastolic dimension and its decrease after CRT were significantly greater in patients with systemic LV. Patients with a systemic LV who were upgraded to CRT from previous ventricular pacing had a better response than the rest of the population (mean increase in EF/fractional area of change of +14.0 (16.5) vs 7.7 (10.9)%, p = 0.101, median decrease in the z score of systemic ventricular end-diastolic dimension of −2.1 vs −0.8, p = 0.036 and decrease in median NYHA class from 3.0 to 1.0 as compared with no change in median values, p = 0.030). Approach to ventricular lead placement (transvenous vs thoracotomy/combined) as well as patient volume (large vs small volume centres) had no significant influence on improvement of EF/fractional area of change (+13.8 (13.5)% vs 7.6 (13.6)% and +9.1 (15.3)% vs 14.8 (12.4)%, respectively, p value NS for both). Predictors of increase in EF/fractional area of change could be evaluated in 31/109 patients with available data and follow-up >3 months identifying the presence of a systemic LV (p<0.001) and higher initial grade of systemic AV valve regurgitation (p = 0.002) as the only significant factors in a multivariable analysis. Patients with concurrent cardiac surgical procedures were excluded from this analysis. Systemic mitral valve regurgitation decreased from a median grade 1 to 0 after CRT (p<0.001) and systemic tricuspid valve insufficiency from a median grade 2 to 1 (p = 0.037). Both initial and latest follow-up systemic atrioventricular valve regurgitation grades were significantly higher in patients with systemic RV than in those with systemic LV (p = 0.025 and 0.005, respectively, table 3). The decrease in systemic AV valve regurgitation was significantly correlated with the increase in EF/fractional area of change (R = 0.536, p<0.001). After excluding patients with concurrent cardiac surgical procedures the overall NYHA class improved by a median of 1.0 grade (p<0.001). Table 1 gives data for specific patients. No change in NYHA class could be seen in patients with dilated cardiomyopathy. There was a positive correlation between initial NYHA class and systemic ventricular end-diastolic diameter (R = 0.554, p<0.001) but no correlation with shortening fraction or EF/fractional area of change. Table 4 summarises the data for patients with a functionally single ventricle. Three of the four patients improved after CRT. Sixteen of the 109 patients (15%) had major cardiac surgery along with CRT implementation, most commonly systemic atrioventricular valve replacement or repair (7/16) in the presence of systemic left (n = 3) or right ventricle (n = 4) or pulmonary artery banding after previous atrial switch for transposition of great arteries (n = 2). In general, these patients had significant improvement in NYHA class (median −1.0 grade, p = 0.008) and EF/fractional area of change (+12.3 (17.1)%, p = 0.031) similar to the rest of the population (table 1). None of these patients died or was judged a non-responder. Acute complications were noted in 10 patients (9.2%): pocket haematoma (four patients), CRT lead dislodgement (two patients, both were transvenous implants under the age of 15 years) and pneumothorax, ventricular fibrillation, fever or rise in pacing threshold during anaesthesia leading to resuscitation (one patient each). CRT had to be discontinued during follow-up in nine patients (8.3%) because of lead failure in six, worsening of heart failure in two and infection of the pacing system in one patient. There was no significant difference in acute complications and CRT discontinuation between patients with transvenous and thoracotomy/mixed lead systems (4.7 vs 15.6% and 10.9 vs 4.4%, respectively) and between large and small volume centres (9.8 vs 8.6% and 11.8 vs 5.2%, respectively); p value NS for all. Fifteen of 81 patients with available data and without concurrent cardiac surgery (18.5%) were identified as non-responders (table 5). Risk factors for non-response were evaluated by univariate and multivariable analysis with the only independent multivariable predictors being primary dilated cardiomyopathy and initial poor NYHA class (table 6). Of the six non-responders with primary dilated cardiomyopathy one had a polyglucosan storage defect and two of the remaining five with no apparent aetiology had baseline QRS duration <100 ms, indicating absence of electrical dyssynchrony. These two patients showed an increase in QRS duration after CRT. Although CRT indication was based on echocardiographic evaluation of mechanical dyssynchrony the interpretation may have been wrong and improvement was not achieved. There was no difference in the proportion of thoracotomy or mixed lead systems between the responder and non-responder group (33/66 vs 8/15 patients). Also there was no patient volume-dependent effect (14.3% of non-responders in the large volume vs 20.8% in the small volume centres, p = 0.560). It is notable that the non-responders included four patients (Nos 27, 28, 62 and 85, table 5) with the otherwise favourable combination of a systemic LV and pacing-associated dyssynchrony. These four patients had severely dilated LVs (z score of the systemic ventricular end-diastolic diameter: +3.3 to +10.3) and a high NYHA class. Patient No 27 underwent a Rastelli procedure with subsequent mitral valve replacement and the myocardial dysfunction may have been a consequence of multiple operations. Patient No 28 had isolated congenital complete atrioventricular block and no apparent reason for the lack of response. Patient No 62 died of malignant ventricular tachycardia 2 months after upgrade to biventricular pacing. Finally, patient No 85 with end-stage heart failure died just 2 days after upgrade to CRT owing to unstable haemodynamics. A total of 22 patients had negative outcomes owing to non-response followed eventually by heart failure-related death or heart transplantation (n = 15, table 5) or owing to discontinuation of CRT for technical reasons or infection (n = 7). Four of the 10 patients originally listed for heart transplantation were removed from the transplant list because of improvement in cardiac function after CRT. No significant predictors of improvement could be found in this small group. During follow-up seven patients died (table 5). These patients were similar to the non-responders characterised by a higher NYHA class (median 4.0 as compared with 2.0 in the survivors, p<0.001). Four of the patients died because of end-stage heart failure. Two of the seven died of ventricular arrhythmia. CRT is a standard treatment option for adults with left ventricular failure associated with mechanical dyssynchrony. The benefits of CRT in paediatric patients and patients with congenital heart disease have previously only been documented in one large study including 103 patients.10 This retrospective multicentre survey is the first analysis of CRT effects in paediatric patients and patients with congenital heart disease based on European data. As compared with the study by Dubin et al10 our paper defines for the first time risk factors for non-response or lack of improvement in systolic function and presents additional important information about the use of CRT in specific patient groups. A systemic LV was predictive of improvement in systolic function and showed more extensive reverse remodelling, whereas systemic right ventricular patients did worse. Both pre- and post-CRT systemic atrioventricular valve regurgitation was higher in subjects with systemic RV. This may be one of the reasons for the less successful reverse remodelling in this group. Patients with a systemic RV may mostly have structural tricuspid valve regurgitation potentially less improvable by resynchronisation than functional mitral regurgitation in systemic LV.20 This is underscored by the fact that overall improvement in systolic function did significantly correlate with the decrease in systemic AV valve regurgitation. Thus the combination of CRT with surgery aimed at decreasing tricuspid valve regurgitation may be a valuable strategy as reflected by our subgroup with concurrent cardiac surgical procedures, and described elsewhere.7 Other reasons for the smaller benefit of CRT in a systemic RV may lie in the different right ventricular architecture and decreased myocardial perfusion reserve as described in patients after atrial switch repair.21 22 Dubin et al10 reported similar improvement of EF in patients with a systemic RV as in the whole CRT population, but did not analyse the change in systemic ventricular size or systemic atrioventricular valve regurgitation or compare these patients specifically with the systemic LV cohort. Correction of electrical dyssynchrony by CRT was highly successful in this patient subgroup, as shown by the significant decrease in QRS duration in this and a previous study.10 Patients with a systemic LV upgraded to CRT demonstrated major clinical improvement and reverse LV remodelling. Dubin et al10 could not find a difference in EF improvement between patients upgraded to CRT from single-site pacing and those with primary CRT. In their study, however, patients were not separated according to systemic ventricular morphology. As seen in our non-responder group some paced patients with a severely dilated LV may not benefit from an upgrade to CRT. CRT might potentially have prevented irreversible LV damage if applied earlier in the course of the disease. Recently, improvement of LV function has been described after a simple change in pacing site from the right ventricular epicardium to the LV apex.23 It remains to be seen whether such a strategy may constitute an alternative to upgrading to biventricular pacing. Two independent predictors of non-response were identified. Patients with idiopathic dilated cardiomyopathy responded poorly and less well than reported in the adult CRT population, where resynchronisation was more successful in this setting than with ischaemic aetiology. Several factors may have been responsible including different aetiology of dilated cardiomyopathy in the young (metabolic disease was present in one of the non-responders) and potential absence of mechanical dyssynchrony in another two, whose baseline QRS duration was short and increased after CRT. The limited follow-up in this group was rather a consequence than a reason for lack of response. Table 5 shows that four of the six non-responders in the group with dilated cardiomyopathy either died or received a transplant shortly after CRT implementation. Worsening of haemodynamics before a later positive effect would be quite unusual as contraction efficacy improves immediately after CRT. Thus CRT could not reverse the malignant course of the disease. The other risk factor for non-response was poor initial NYHA class. Whether this finding would argue in favour of offering CRT at an earlier stage to prevent irreversible ventricular deterioration is unclear from the present data. Whereas in the report by Dubin et al10 the only difference between responders and non-responders was the higher initial systemic EF in the latter (“too well to benefit” as speculated by the authors themselves) and their analysis did not include type of heart disease as an independent variable, our study was able to define risk factors for non-response. In contrast to the cited report our definition of non-responders required, besides the absence of an increase in EF, lack of improvement in functional NYHA class. Thus criteria used for identification of non-responders were stronger and this may itself account for some differences in the analysis. Interestingly, this study showed that CRT could be equally safe and effective independently of the patient volume treated in each contributing centre. All the participating institutions were, however, tertiary centres combining an extensive cardiological and surgical experience in treating congenital heart disease. Thus, institutional background rather than the actual volume of patients treated is probably more important to achieve satisfactory results. The limitations of this study are its retrospective design, lack of predefined indication criteria for CRT implantation, relatively soft criteria for identification of CRT response (functional and/or echocardiographic improvement), incomplete clinical and echocardiographic datasets, methodological difficulties in the evaluation of a systemic right ventricle and lack of other functional assessment than the NYHA classification. The systemic ventricular shortening fraction used for quantification of systolic function may be inaccurate in the presence of ventricular dyssynchrony. Its use was, however, limited to evaluating changes due to CRT in selected individual patients in whom EF or fractional area of change were not available. The shortening fraction was not used for any analysis of overall CRT efficacy. Further, accuracy of NYHA classification is questionable in the congenital atrioventricular block group owing to the median age of 3.6 years. Given the age of the remaining patients, the small size of the congenital atrioventricular block group and the limitation of the alternative Ross heart failure score (applicable only to infants), the authors nevertheless found that NYHA was useful and practical for describing functional CRT efficacy in this retrospective setting. Patients with primary dilated cardiomyopathy seem to be a mixed population in this study making general conclusions about CRT efficacy difficult. And, finally, this study was not primarily focused on use of CRT in heart transplant candidates and although some patients could be delisted after CRT, others were transplanted because of non-response. Thus the utility of CRT in this patient group cannot be clearly assessed from our data. Despite these limitations and a wide variety of heart disease included, the study group was large enough to allow for meaningful and significant conclusions. Overall, CRT in this population was at least as effective as in adults with heart failure. The response was, however, dependent on the structural and pathophysiological substrate being most favourable after upgrades from single site to biventricular pacing in patients with a systemic LV and generally less favourable in patients with a systemic RV and in children with primary dilated cardiomyopathy, where proper patient selection might improve the results. NYHA class was poorly correlated with systemic ventricular function and it is questionable whether it is a major criterion for CRT indication in congenital heart disease.
. Comparison of Medical Therapy, Pacing, and Defibrillation in Heart Failure (COMPANION) Investigators. Cardiac-resynchronization therapy with or without an implantable defibrillator in advanced chronic heart failure. N Engl J Med 2004;350:2140–50.
. Cardiac Resynchronization-Heart Failure (CARE-HF) Study Investigators. The effect of cardiac resynchronization on morbidity and mortality in heart failure. N Engl J Med 2005;352:1539–49.
. Biventricular pacing as alternative therapy for dilated cardiomyopathy associated with congenital heart disease. Pacing Clin Electrophysiol 2001;24:235–7.
. Dilated cardiomyopathy associated with dual-chamber pacing in infants: improvement through either left ventricular cardiac resynchronization or programming the pacemaker off allowing intrinsic normal conduction. J Cardiovasc Electrophysiol 2004;15:470–4.
. Cardiac resynchronization as therapy for congestive cardiac failure in children dependent on chronic cardiac pacing. Cardiol Young 2006;16:187–9.
. Initial experience with cardiac resynchronization therapy for ventricular dysfunction in young patients with surgically operated congenital heart disease. Am J Cardiol 2004;94:1352–4.
. Cardiac resynchronization therapy: a novel adjunct to the treatment and prevention of systemic right ventricular failure. J Am Coll Cardiol 2004;44:1927–31.
. Dilated cardiomyopathy following right ventricular pacing for AV block in young patients: resolution after upgrading to biventricular pacing systems. J Cardiovasc Electrophysiol 2006;17:1068–71.
. Cardiac resynchronization therapy in congenital heart disease. Int J Cardiol 2006;109:160–8.
. Resynchronization therapy in pediatric and congenital heart disease patients. An international multicenter study. J Am Coll Cardiol 2005;46:2277–83.
. Normal values of M-mode echocardiographic parameters in children. Cesk Pediatr 1984;39:699–708.
. Detrimental ventricular remodeling in patients with congenital complete heart block and chronic right ventricular apical pacing. Circulation 2004;110:3766–72.
. Altered cardiac histology following apical right ventricular pacing in patients with congenital atrioventricular block. Pacing Clin Electrophysiol 1999;22:1372–7.
. Congenital heart block: development of late- onset cardiomyopathy, a previously underappreciated sequela. J Am Coll Cardiol 2001;37:238–42.
. Dilated cardiomyopathy in isolated congenital complete atrioventricular block: early and long-term risk in children. J Am Coll Cardiol 2001;37:1129–34.
. Dual chamber and VVI implantable defibrillators trial investigators: dual-chamber pacing or ventricular backup pacing in patients with implantable defibrillator: the dual chamber and VVI implantable defibrillator (DAVID) trial. JAMA 2002;288:3115–23.
. A randomized comparison of atrial and dual-chamber pacing in 177 consecutive patients with sick sinus syndrome. J Am Coll Cardiol 2003;42:614–23.
. Adverse effect of ventricular pacing on heart failure and atrial fibrillation among patients with normal baseline QRS duration in a clinical trial of pacemaker therapy for sinus node dysfunction. Circulation 2003;107:2932–7.
. Acute effects of cardiac resynchronization therapy on functional mitral regurgitation in advanced systolic heart failure. J Am Coll Cardiol 2003;41:765–70.
. Myocardial perfusion and function of the systemic right ventricle in patients after atrial switch procedure for complete transposition: long-term follow-up. J Am Coll Cardiol 2000;36:1365–70.
. Role of ischemia and infarction in late right ventricular dysfunction after atrial repair of transposition of the great arteries. J Am Coll Cardiol 2000;35:1661–8.
. Reversal of pacing-induced heart failure by left ventricular apical pacing. N Engl J Med 2007;357:2637–8. Funding: Ministry of Health, Czech Republic (grant NR/9472-3 to RAG) and University Hospital Motol, Prague, Czech Republic (research project No 64203 to RAG). © Janoušek et al 2009 This is an open-access article distributed under the terms of the Creative Commons Attribution Non-commercial License, which permits unrestricted use, distribution, and reproduction in any medium, provided the original work is properly cited.